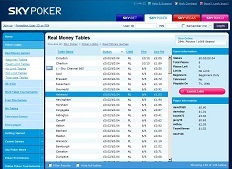 Sky Poker is unlike any other poker site you will have come across online. 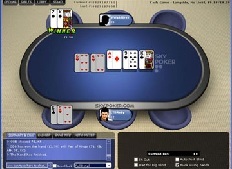 The Sky Poker software enables players to play online poker on their television through the Sky Poker TV via satellite. The Sky Poker software loads instantly into any browser making it a great fit for Mac, Windows and Linux players and is one of the most interactive and community based sites out there. The Sky Poker tournaments are televised live and not only will you find yourself up against other players in real-time, but the live tournaments include announcers and railing just as you would expect from a real game. You can find more information about Sky Poker's software below, as well as how to access the televised games and our own exclusive Sky Poker bonus for new players. 100% Up to £1000 Bonus - Use Bonus Code 3X3X3! What's so unique about Sky Poker? For starters they offer live poker games, but not only that, the online games are instant. The Sky Poker room uses in instant play software client powered by a flash application. All of the Sky Poker games are available on site, and will not require you to do anything fancy. In fact, all you have to do is visit the SkyPoker.com website, create an account and select a game from the lobby. Before you can play on the Sky Poker TV channel, you will need to have an existing account. You can create a new account by clicking this link here to join Sky Poker. The poker room will ask for your name, home address, phone number and you can create your username and select your avatar. Once complete players can head to the poker room cashier and make a deposit. After you have successfully loaded your player account, just click on the "Televised Tournament" tab and select from one of the upcoming events. Once you've registered into a tournament visit the Sky TV channel located on channel 846 via satellite and watch live coverage of your game. You can find your game on the Sky Poker TV by using the arrow keys on your remote. With the lobby open select 1 for all cash and play money games, 2 for tournaments and 3 for 'My Tournaments'. What makes this feature interesting is that while your playing in the online version of Sky Poker you can also watch the tournament on your TV. The Sky TV includes a virtual looking card room with two announcers who analyse the game, similar to other nighttime poker shows. The satellite channel isn't the only interesting characteristic of Sky Poker. The poker room is universal for all operating systems due to the flash poker room and does not require any download in order to access the games. This is great for players that like to play poker on the fly. The software is extremely friendly to use and is easy enough for a beginner all the while supporting the standard options experienced players would expect to see. Once you have your account set up simply login and click the Play Now button on the poker room website. The lobby will load instantly in either Internet Explorer or FireFox, and will provide you with a complete listing of available cash games (all of which are played in Euros). The tab menu above provides options for sit n go's, tournaments, search features, the community forum, your account info and finally, an informative FAQ guide. The main lobby is very specific and detailed. You will be able to search for games based on format, such as fixed limit, pot limit, no limit as well as a "Televised" link, that displays all live events. Live events are available for cash games and tournaments. The tables are clean and simple with a blue background and cartoon like avatars. Beginners can take advantage of the "Hot-O-Meter" which provides players with a hand-ranking tool. This feature will sum up your hand based on strength and for the novice player, SkyPoker.com offers an online poker school. What we do like with the Sky Poker.com software is the overall integration between the online poker and the main website. When the flash poker room loads, it loads right on the Sky Poker website. You will never need to leave the site to play any of the games nor make your deposit and as a side benefit can also check out the bingo room, games room and sports book owned by Sky.com. Deposit £500 and receive £500 in bonus dollars which can be cleared in any real money game. Sky also has daily draws giving away £50 free to new depositing players only.